I mean, come on! I have made my 1-Hour Cinnamon Rolls recipe a zillion times. But it was not until recently that the idea even occurred to me to brown the butter in it. Once I had the idea, though, you’d better believe I made a batch of these stat. But then I didn’t even think to add brown butter to the cream cheese frosting, so then I had to make a second batch. And then I got so frosting-happy that I poured basically a lake of frosting on them which — while heavenly — was not quite photogenic. So alas, I just “had” to make a third batch with a reasonable amount of frosting. And, ahem, taste test them too. Seriously, though, back to brown butter. I considered just popping a note in the original 1 Hour Cinnamon Rolls recipe suggesting that people also try it with brown butter. But frankly, this version tasted epic enough that it felt totally worthy of its own super special post. The brown butter changed everything! Sure, they are still sweet and soft and doughy and cinnamon-sugary as always. But brown butter brings a depth and nuttiness to any recipe that’s unlike any other ingredient. And it’s so easy to make too! I have included instructions in the recipe below for how to make brown butter on the stovetop (classic). But I discovered a few years ago that it’s also super easy to make in the microwave, and have been doing that ever since. Just pop your butter in a very large microwavable bowl. (You need a large bowl because it will bubble up and you don’t want it to overflow.) Then microwave it for about 3-5 minutes or until the butter turns a nice amber color. You don’t want it too dark, or it will burn. But you also don’t want it too light, because then it isn’t as flavorful. So aim for a nice middle ground. Then mix up your simple dough, let it rise, then roll it out into a large rectangle. Brush some of your melted brown butter on it (and don’t worry if a little spills over the sides of the dough). 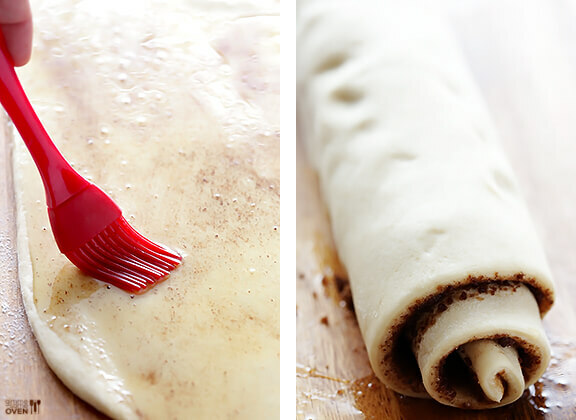 Then sprinkle it with your cinnamon and sugar mixture, and roll the dough up nice and tight. Cut it into 12 equal pieces and place it in a greased baking dish, and let the rolls rise awhile longer. Then bake them for 15-20 minutes until slightly golden on top and cooked through. And whip up your brown butter cream cheese frosting while they are a-cookin’. …and then dive in and grab a bite while they’re still warm. Trust me. Once you try this brown butter version, I’m pretty positive there will be no going back. Brown butter makes all the difference in this delicious (and quick!) 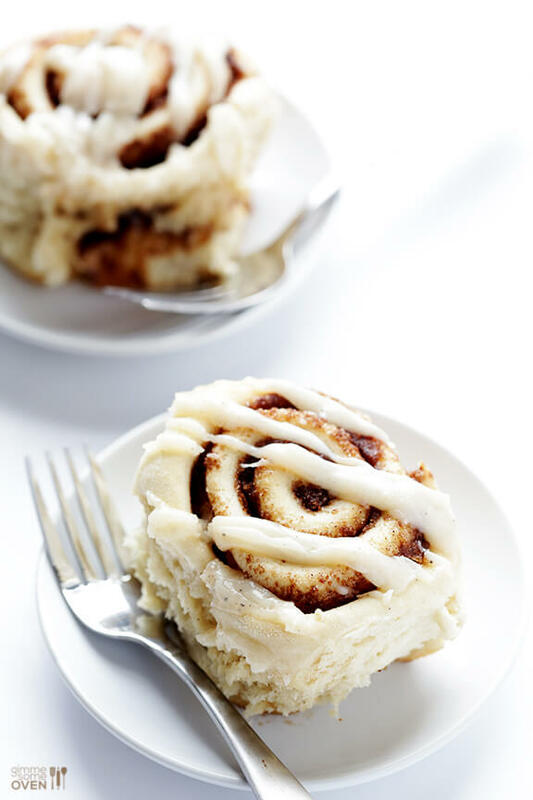 Brown Butter Cinnamon Roll recipe. Before you begin making the dough and filling, prepare your brown butter. 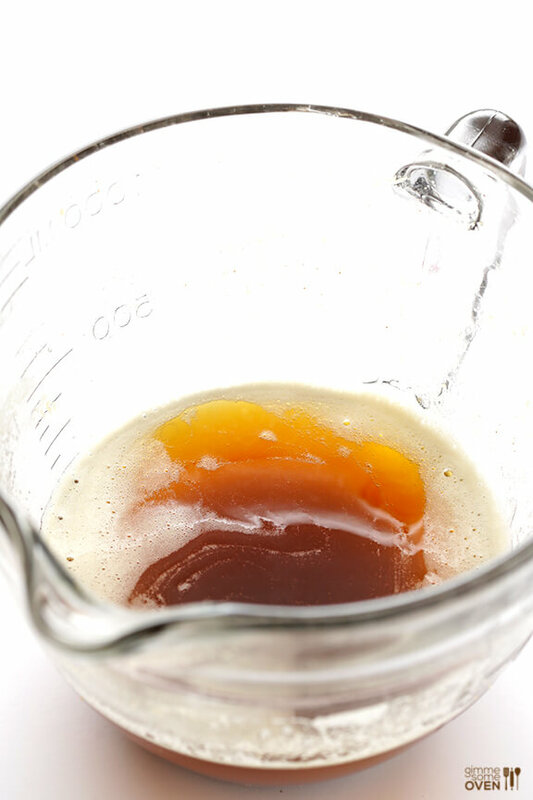 To make brown butter in the microwave, place butter in a large microwaveable bowl and heat for 3-5 minutes, or until the butter has come to a boil and then turns an amber color. Be careful that the butter does not burn. To make brown butter on the stove, place butter in a large saucepan and heat over medium-high heat until boiling. Let the butter boil for 2-4 minutes, or until it turns an amber color. Be careful that the butter does not burn. Pour the milk into a microwave-safe bowl. Heat on high in the microwave for 30 seconds, then remove and stir in the melted brown butter, and test the temperature with your finger. You want the mixture to be lukewarm, but not hot to the touch. If it is too cool, continue heating the mixture in the microwave for 20 second intervals, pausing after each to stir, until the mixture reaches the correct temperature. 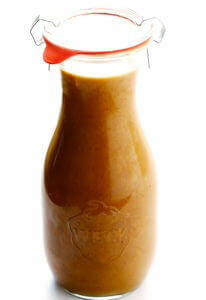 If the mixture gets too hot, let it sit out for a few minutes until it has cooled to the lukewarm temperature. In the bowl of a stand mixer (**see note below for an alternative method of making this by hand*) fitted with the dough hook attachment, add yeast and lukewarm milk mixture and stir by hand to combine. 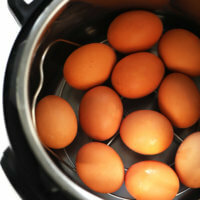 Add the flour mixture and egg, and beat on medium-low speed until combined. If the dough is sticking to the sides of the bowl, add the remaining flour, 1/4 cup at a time, until the dough begins to form a ball and pulls away from the sides of the bowl. Continue beating for 5 minutes on medium-low speed. Remove the dough hook and cover the bowl with a damp towel and let rest for 10 minutes. Meanwhile, make your filling by whisking together sugars and cinnamon in a bowl until evenly combined. When the dough is ready, turn it out onto a floured work surface. Then use a floured rolling pin to roll the dough out into a large rectangle, about 14 x 10 inches in size. (If you want all edges to be even, you can use a pizza slicer to cut the dough into a perfect rectangle.) Use a knife or pastry spatula to spread the melted brown butter evenly over the entire surface of the dough. Then sprinkle the cinnamon and sugar mixture evenly on top of the melted butter so that the entire surface of the dough is covered. Beginning at the 14-inch edge, tightly roll up the dough. And then give the final seam a little pinch so that it seals. Use a piece of dental floss*** to “cut” off the two ends of the roll (an inch on each end) so that they are even, then discard the dough that was cut away. Use the floss to cut the remaining dough into 12 equal pieces. When the rolls have risen, uncover the dish. Then place on the center rack of the oven and bake at 350 degrees F for 15-20 minutes, or until the rolls are golden and cooked through. Remove and let cool on a wire rack for at least 5 minutes. 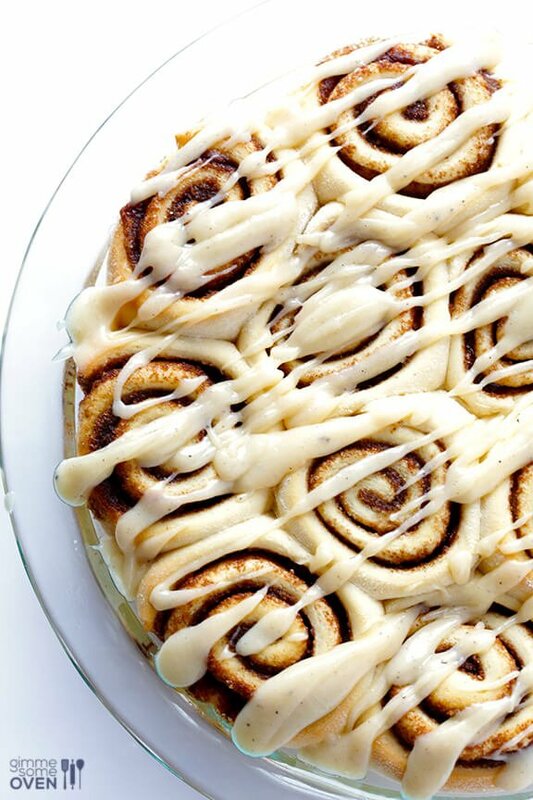 Drizzle with frosting and serve. Either in the bowl of an electric stand mixer, or a mixing bowl, whisk the melted brown butter and cream cheese together until combined. Add in powdered sugar and whisk until combined. If the icing is too thick, add a tablespoon or two of milk to thin it out. I was actually totally planning on developing a cinnamon roll recipe today! BUT – I’ve actually never made any from scratch. CRAZY RIGHT?! So I was scared…I think I’ll just make your recipe instead. Brown butter? I am in! Pinned! These buns look just perfect :) seriously! Perfection in a bun and perfect for fathers day! 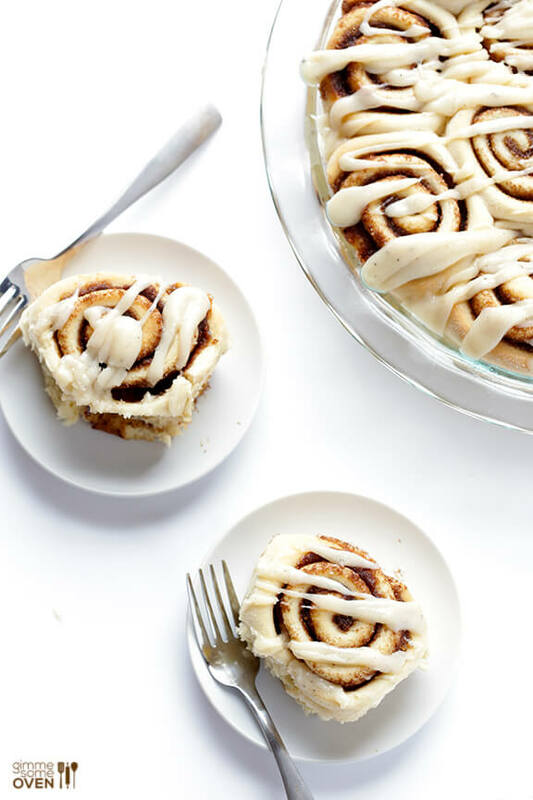 Oh my, it’s cinnamon rolls like this that make me so glad I’m not a food blogger! I’d be like 400 pounds because I’d have no self control when these came out of the oven. 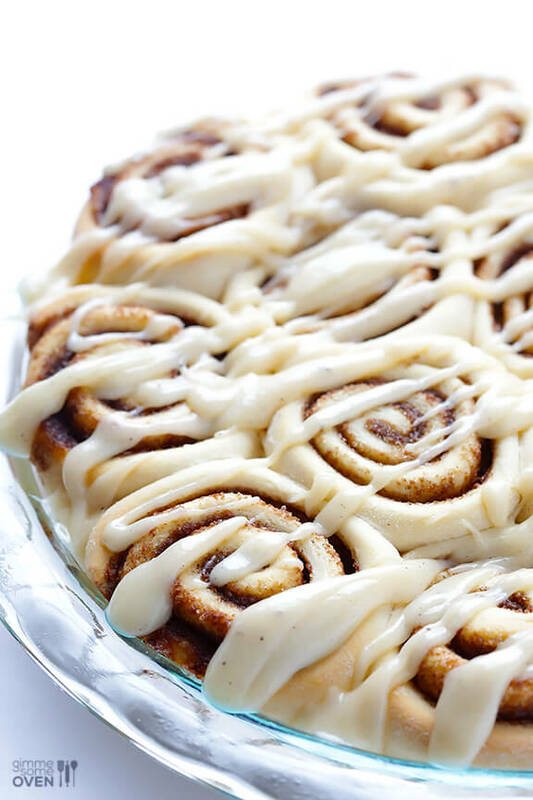 Brown butter cream cheese frosting…………oh this is gonna be good! A bit confused by your instructions in making the dough. You say to heat the milk and butter in the microwave until the butter is melted… but isn’t the brown butter made separately? So should you warm the milk separately as well until it is lukewarm and then combine with the brown butter? Ah, sorry for the confusion Laura. The recipe is edited now. Thank you!! Smudge would eat the whole pan! Exactly the reason to make them. Cinnamon buns in an hour?? I can handle that. YUP. Ali…. This is pure genius!!!! brown butter & cinnamon rolls are my two favorite things in life. I’m dead. I need a batch of these this weekend! A perfect Father’s Day recipe!!!! This looks beyond yummy. I was secretly hoping to see a picture of the ones with a “lake” of frosting on them. Oh man these look so good. I love love love cinnamon rolls on weekend mornings. Right out of the oven when they are still steaming hot. I can only imagine how wonderful they would be with browned butter. 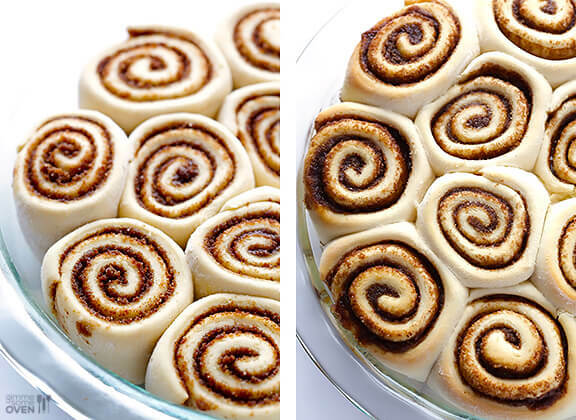 Your 1-hour cinnamon rolls are a go-to classic at our house. Can’t wait to try these! whoaaaaaa awesome!!! these look so yummy! 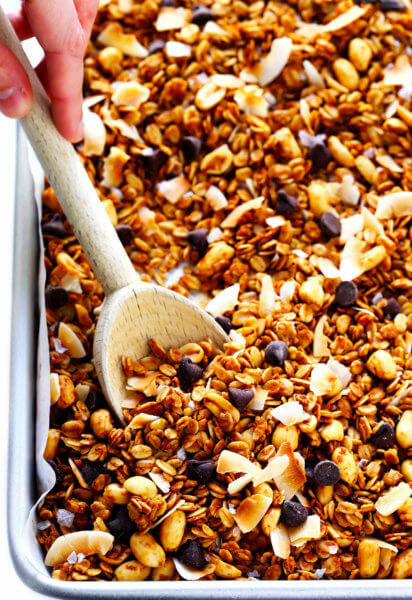 I have saved this recipe so I make sure I actually try making it! How can I not? They look absolutely delicious and so perfect! You must be quite the bread maker. Brown butter makes the world a better place. I can’t wait to try these! I love your full disclosure, aka use a lot more frosting than what is pictured. :) Yes, these definitely look picture perfect, and what a great way to improve your I-thought-they-were-already-perfect cinnamon rolls. Gorgeous! I am obsessed with brown butter, these look incredible! do I have to put butter and milk together? And do I use the brown butter for the dough or do I just Cover it with it?? Yes, you will brown all of the butter first. Then heat the brown butter with the milk. And you will use some of the brown butter for the dough AND the topping. Lots of brown butter! :) Enjoy! 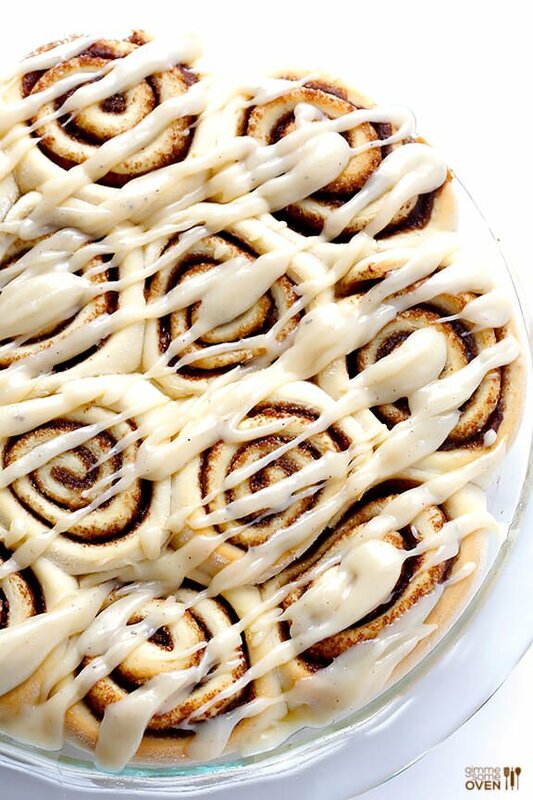 Hi, can I make the brown butter cinnamon rolls ahead of time and then put them in the oven the morning after. Your Last edit fully omitted the brown butter in the instructions for the dough portion, the 1/4 cup. Made these today, and they were a total hit! Although I’ve got to say, I’m really impressed with your cinnamon bun making skills, because they took me a solid 2 and a half hours from when I started to when we finally ate. My lack of a stand mixer/dough hook definitely didn’t help. That said, I’m still probably going to make them again, which is definitely saying a lot about how wonderful they are! Thanks Kim! They definitely take some doing, and some time, but are so worth it in the end! And having a dough hook really does help. I’m so glad you enjoyed them, thanks for giving the recipe a try! These look amazing! I’ve made many cinnamon roll recipes trying to recreate something close to my grandmother’s. Unfortunately, her amazing recipe went with her. Thanks, Cynthia! I hope these are somewhat close! Hi Ali, I’ve made these before and they were AMAZING! I would like to make them for Christmas, but do you have any recommendations on how to make them mini? i.e. I’d like to get more than 12 servings, and make the portion smaller. Thanks Kelly, we’re so happy you love these! Hmmm, we think if you just slice the rolls thinner, that might work (so you can try and get 24 instead of 12). We hope this helps! Making these for Christmas morning!! Have you tried making them the night before so they’re ready to be popped in the oven the next morning? Do you think they would turn out the same? Hi! 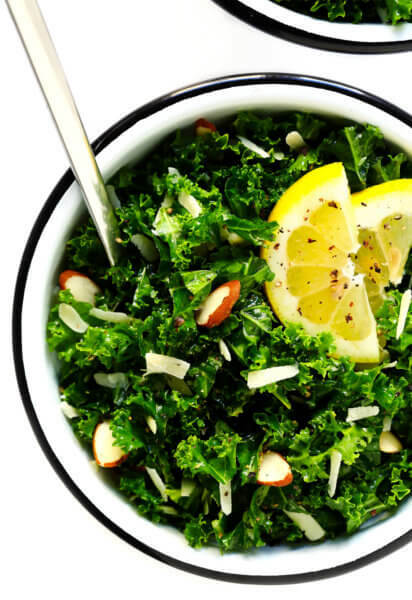 I’ve made this recipe several times and it’s ABSOLUTELY DELICIOUS! I was curious what size pie dish you use, standard 9″? I’ve only used a 9×13 pan and the rolls seem to fill it up completely once baked. I’m a bit concerned the pie dish doesn’t have enough space. Thanks! 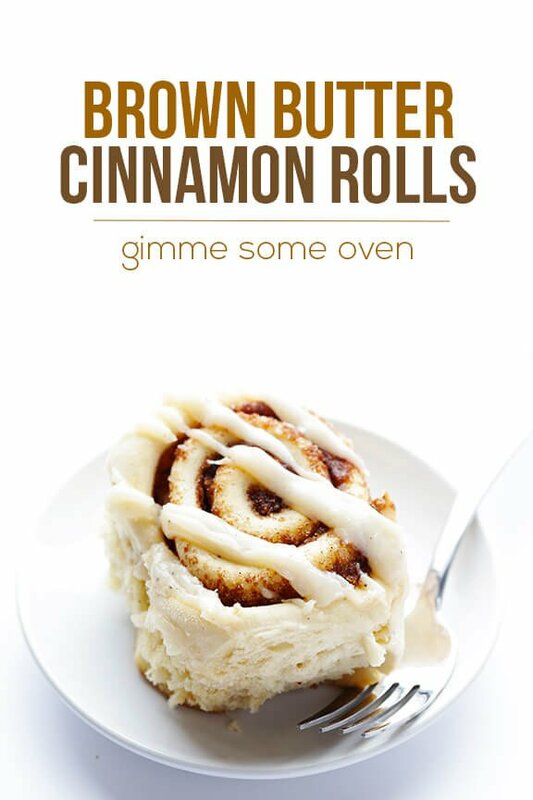 Not sure why I have not thought of making my cinnamon rolls with brown butter before, but glad I saw this! They look great and will be making the next batch with brown butter! 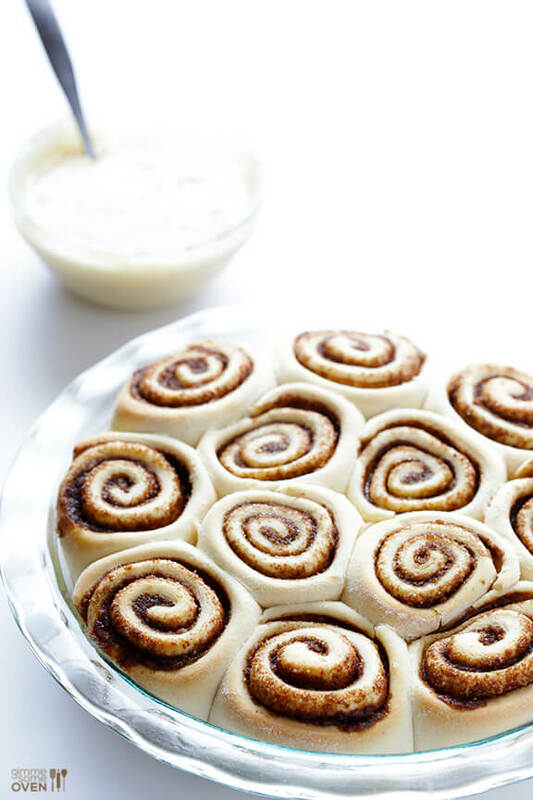 BTW, I also put 1-Tablespoon of cinnamon into my dough…after all they are cinnamon rolls! Just made theses for New Year’s Eve breakfast, and I just had to post to say they are absolutely delicious! I will make them the night before next time, and there will be a next time. They weren’t ready until noon because I am not exactly a morning person. Oh well, plenty left for tomorrow, and I think theyll reheat just fine in the toaster oven. For those who are wondering, the total amount of butter you need is about two tablespoons shy of two sticks. I messed up and mixed the butter with the sugars for the filling. It worked out since the butter was still melted, but I’ll try the other way in the future. Thanks for the amazing recipe! Oh my gawd best cinnamon rolls ever! I thought you’d get better flavor with a slow rise with regular yeast but rapid rise version taste just as good! Also I put 1 tablespoon of white vinager in the milk to make it Buttermilk amd the rolls turned out tender and fluffy! The brown butter really makes these rolls so flavorful. I’m only gonna make brown butter cinnamon rolls from now on! Thanks for the recipe!